Well this is not a medical joke or something that I made up. This syndrome is legit and very irritatting for the people who suffer from it. As said by Pryse Phillips the acronym is slightly forced but remains the best of the decade. 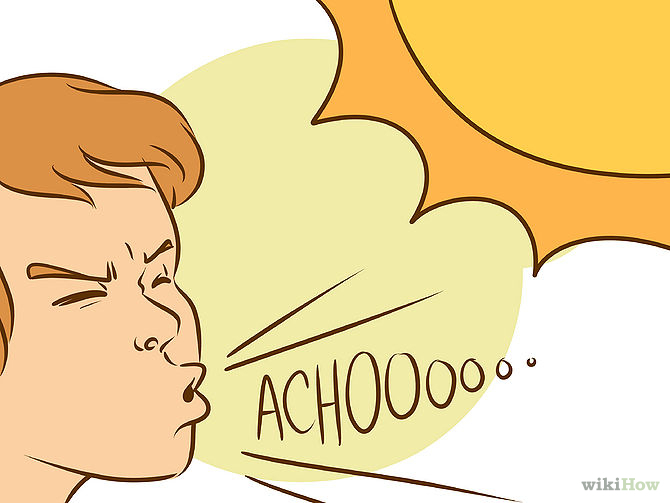 The acronym ACHOO is for Autosomal Dominant Compelling Helio-Opthalmic Outburst reflex which is basically sneezing in response to looking at a bright light, there can be a burst of 2-10 sneezes at a time. Photic sneeze reflexes don't seem to make any sense at first. 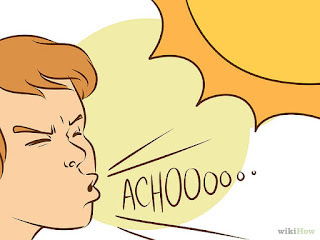 The purpose of sneezing is to clear unwanted irritants or germs from the nose. Bright light produces neither. The phenomenon was first described in the 1950s, after a French doctor discovered several patients sneezing in response to the light of his ophthalmoscope, (the device doctors use to examine the retina). Further investigation revealed that it wasn't just any light that brought on the sneezing, but sudden flashes. These patients would reliably sneeze when quickly exposed sunlight, flash photography, and, in a few cases, even ultraviolet light. There is no clear understanding on how photic sneez reflex works and hence a variety of theories have been proposed. For us its important to understand the basics of a normal sneez reflex arc. The opthalmic division of the trigeminal nerve innervates the the nasal mucosa over the nasal septum and the anterior nasal passages. The afferent limb of the reflex arc is carried over the opthalmic nerve and the efferent limb is by the cranial nerves 5 and 7,9,10 and the motor nerves of the cervical and thoracic spinal cord. The reflex centre is situated in the brainstem and upper spinal cord. Any stimulation of the afferent limb of this reflex arc by dust or any foreign material sets the reflex arc in action which ultimately makes us sneez! The primary clinical use of this sneez (sternutatory) reflex is a cross check on the corneal reflex. Are there any other weird stimuli that cause people to involuntarily sneeze? Sneezing induced by feeling full. (One case study of a relatively normal 32-year-old man found that "fullness of the stomach immediately after meals invariably results in three or four uncontrollable sneezes." And the weirdest: For some, eating chocolate can induce some unwanted sneezes how barbaric. Well I hope this information was helpful. So the next time you hear some sneezing (ACHOO!) do remember this phenomenon. Why is the level of Vitamin B12 increased in CML?